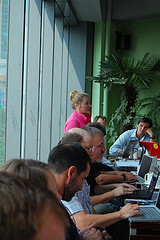 Thought you might like to see some pics from my time at Learning 2.008. Anyone who knows me well knows my history with cameras is not a good one. Last year on a trip to China I lost two! My own and the camera of the teacher I went with. Expensive exercise that one. This time I didn’t lose the camera, but I did forget to take it with me while I was out on the Bund at night. Missed those brilliant photo opportunities showcasing Shanghai when it looks at its best – at night when the lights are stunning and pollution pales. Quite a few of these pics are ones taking by others at the conference and posted on Flickr with the tag learn2cn. That’s the beauty of Flickr – if you miss something you can bet someone else hasn’t. This is me talking about my experiences at Edubloggercon. Adrian Bruce was watching on ustream and said I had a ‘boy look’. This was because I had no luggage and no access to the hair straightener!! 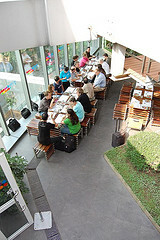 Edublogger table table viewed from on high. 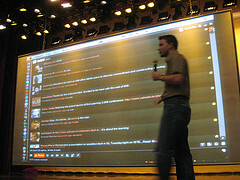 Jeff Utecht explaining Twitter at the opening of the Conference. 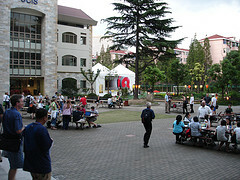 The Conference Courtyard – Macs all round. My pc looked pretty lame. Clarence Fisher and a slide with a quote from one of his students. So true. 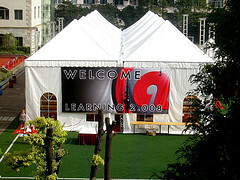 The tent that was used for breakfast, lunch and opening night dinner. Note the astroturf playing field it is situated on. 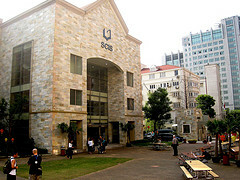 SCIS -Shanghai Community International School (I think I’ve got that right) They hosted the Conference. Great facilities. 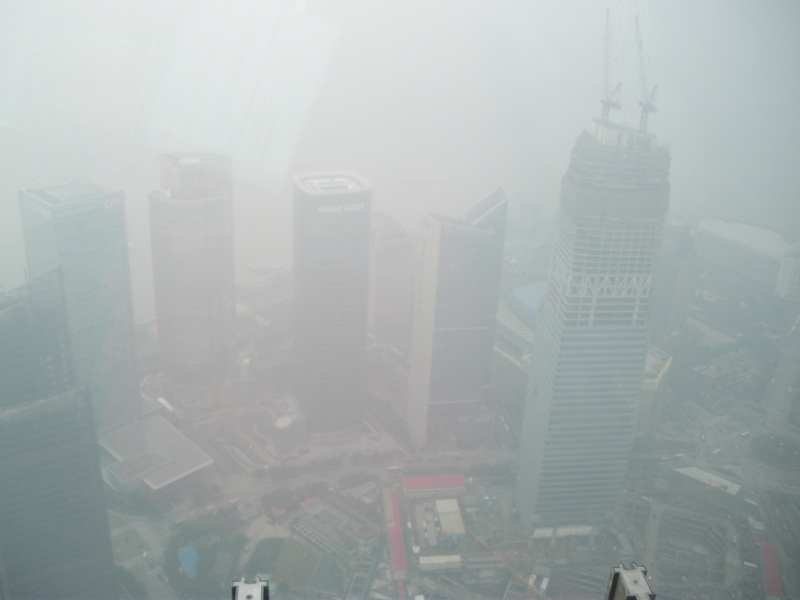 View of Shanghai from the JinMao Tower. This was at 11.00am. Gives you some idea of the issues they have with pollution. It was hard to determine if it was fog and pollution or just pollution. 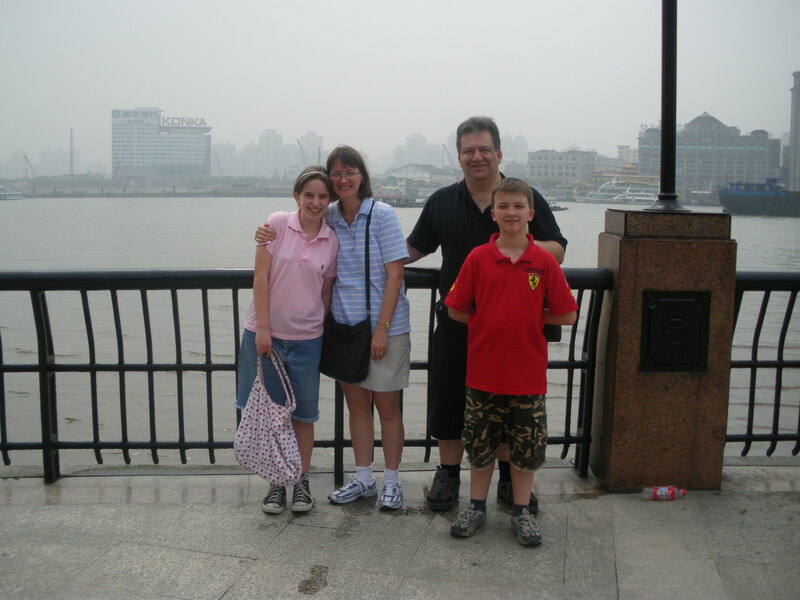 The family from my school who met up with me in Shanghai. Thanks Paul, Lucia, Christina and Michael for a great day. I’m still trying to get my thoughts together about the Conference. Already I’m talking with a teacher in Singapore about some collaborative project work. That’s the beauty of making face to face connection – the collaborative opportunities present themselves more naturally when you can get a sense of the person you will be working with. Hope the pics give you a sense of what things were like in Shanghai. Great post! I wish I could have been there. I’m glad you were able to discuss your experiences with other teachers and hopefully collaborate with them in the future! I wish I could have there. Thanks for sharing. I was there … and Jenny was awesome! Thanks for posting this. It gives a good account of your stay. The photos are great. Great post Jenny. Glad you enjoyed it.